Wedding Planner insurance for 365 days, available instantly online. 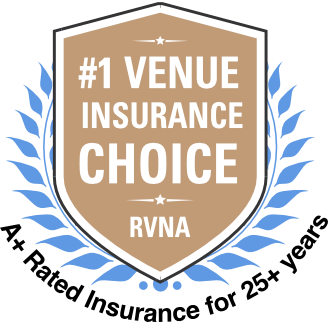 RVNA offers Wedding Planner insurance coverage tailored to your needs. Every wedding planning business is unique so why limit your coverage options? Customize your insurance policy with 3 optional coverages that fit all your needs. Up to $2 Million in Liability coverage now available. General Liability insurance protects a wedding planner business against lawsuits claiming bodily injury or property damage to third parties. Property Damage Liability and much more! Property Plus is available to Wedding Planners for all their office and business equipment. Your equipment will be covered using replacement cost (new for old) not actual cash value. We also have no per item maximum on individual items. RVNA’s property plus coverage is hassle-free; you never have to provide us with a list of your equipment to be insured! What happens if an employee steals from you? Protect your wedding planning business with Crime coverage. Dishonest acts of employees (such as theft of all of the business equipment by an employee) are excluded from the property policy, so Crime Plus was created to fill a coverage gap. Crime insurance protection includes coverage for employee dishonesty, forgery or alteration, and theft, disappearance and destruction of money and securities. WONDERING WHAT COVERAGE YOU NEED FOR YOUR WEDDING PLANNING BUSINESS? Just ask. Call us at 1-800-364-2433 or visit Wedding Planner Insurance FAQs for more information. Wedding Planner Insurance is offered by R.V. Nuccio & Associates, Inc., providing event insurance for over 25 years. The coverage we offer is preferred and often recommended by venues nationwide. I love everything about working with RV Nuccio!! We are a boutique style event planning firm who handles 20-25 wedding & events per year. So we must carry liability insurance in order to work at the different venues. The thing I love most is the human interaction. Their response time to my emails is also very fast. They are friendly, reliable and most importantly professional. Their rates are amazing!! On 8/23/18 I was in stress mode as I realized my policy was one day past the renewal date. Yes, they did send me a friendly reminder, but it slipped my mind to act upon it. I called and spoke with [RVNA]. [They are] a true gem as [they] displayed patience and confidence. [They] listened, we laughed and [they] had my policy back up and running in no time. Why do I need Wedding Planner Insurance? On top of insurance being a requirement for almost all venues, every event planner knows that when organizing an event they should hope for the best and prepare for the worst. That’s exactly what you need to do for yourself and your wedding planning business. A simple slip and fall over a cord placed by a vendor on the floor can result in an injury that could leave you responsible for thousands of dollars in legal fees and reimbursements. Where can I buy Wedding Planner Insurance? Wedding Planner Insurance from R.V. Nuccio & Associates Insurance Brokers, Inc. is available to quote and buy online 24/7 at RVNuccio.com or by phone Monday through Friday from 5:30am – 5:00pm PST at 1-800-567-2685. What does Wedding Planner Insurance cost? Wedding Planner Insurance from R.V. Nuccio & Associates, Inc. offers 3 optional coverages that can be tailored to meet the specific needs of your business. Wedding Planner Annual Policies start at $81. RVNA General Liability protects Wedding Planners against lawsuits involving injuries to others and damage to property of others (ex. accidentally scratching venue walls while decorating). This coverage is available with optional limits and includes legal costs in addition to the selected limit. What does Property Plus cover? Property Plus provides insurance coverage for Wedding Planner’s office and business equipment up to the selected limit, for losses caused by theft, damage, fire, hurricanes, earthquake, flood, and more! The coverage is provided on a replacement cost basis (new for old), not actual cash value. What does Crime Plus cover? Crime Plus protects you against exposure to financial losses due to employee dishonesty, forgery, alteration, theft, disappearance or destruction. This policy has three coverages that are outlined below for your reference. Employee Dishonesty Provides protection up to the limit selected and subject to a per loss deductible, for the loss of money, securities and other Event, Meeting or Wedding Planner equipment or property resulting directly from one or more fraudulent or dishonest acts committed by an employee acting alone or in collusion with others. Forgery Or Alteration Provides protection, up to the limit selected and subject to a per loss deductible, for loss resulting from forgery or alteration of outgoing checks, drafts, promissory notes and similar instruments drawn against the Insured’s accounts. Theft, Disappearance, And Destruction Provides protection, up to the limit selected and subject to a per loss deductible, for loss resulting from theft, disappearance, and destruction. This coverage is divided into two parts, each with its own separate per loss limit. PART A: Loss Inside The Premises Provides protection up, to the limit selected and subject to a per loss deductible, for the loss of money and securities by the actual destruction, disappearance or wrongful abstraction thereof, within the premises. PART B: Loss Outside The Premises Provides protection, up to the limit selected and subject to a per loss deductible, for the loss of money and securities by the actual destruction, disappearance or wrongful abstraction thereof, outside the premises while being conveyed by a messenger, or while within the living quarters in the home of any messenger. In most cases, the ‘messenger’ would be your Event, Meeting or Wedding Planner employee collecting money or checks on your behalf. The territory of this policy is anywhere within the United States and Canada.